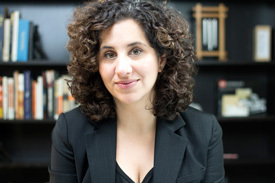 The University of Michigan Chamber Choir will perform a concert celebrating the diverse voices of Michigan composers and poets, including the world premiere of Lifesmithing by SMTD composition professor and alumna Roshanne Etezady. The work highlights the poetry of incarcerated Michigan writers who participate in the U-M Prison Creative Arts Project (PCAP). The free concert (no tickets required) takes place on Friday, October 19 at 8 pm at Hill Auditorium and will be led by Professor Eugene Rogers, director of choral activities, with Scott Van Ornum as accompanist. The program will also include a work by the winner of the 2018 Brehm Prize for Choral Composition, Maria Paterno (MM ’19, composition). Titled Pyre, the piece features a text by Michigan poet Savannah Gonsulin and explores the poem’s conflicting and ever-shifting emotions, moving from anger to sorrow to bittersweet nostalgia. A pre-concert talk will take place in the lower lobby of Hill Auditorium, at 7:15 pm, featuring Rogers, Etezady, and Professor Ashley Lucas, the director of PCAP and an associate professor of theatre & drama at SMTD.